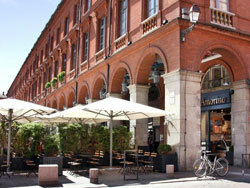 Discover irresistible cuisine, a lively atmosphere and authentically French culture in Toulouse! 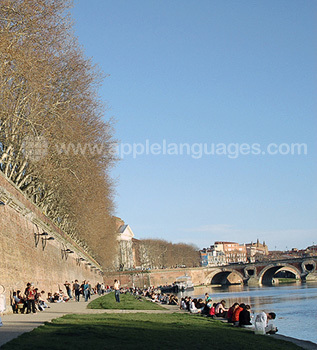 Learn French in Toulouse and experience an elegant city with prestigious art galleries, plus a beautiful old town. Indulge in some lamb cassoulet or foie gras in a riverside restaurant, before heading down to Place Wilson to sample the city’s vibrant nightlife! This charming university city boasts an enviable position in the scenic south-west of France. It’s within easy reach of the Pyrenees, and almost midway between the Atlantic and France’s glamorous Mediterranean coast. Just outside Toulouse is the Cité de l’Espace, where you can experience weightlessness and go on a virtual trip to the Mir space station! 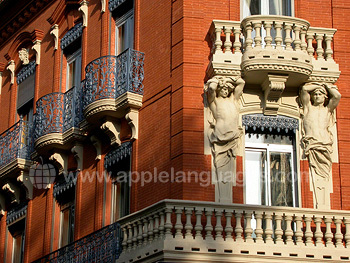 Our Toulouse school is situated right in the historical centre of Toulouse, close to the magnificent Saint-Sernin Basilica and within easy reach of the city’s main sights. An attractive historical building is home to our French language school in Toulouse, which is comprised of 10 bright, air-conditioned classrooms, a student lounge and computer room with free Internet access. 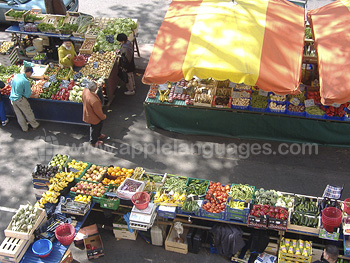 There is a daily farmers’ market outside the school, giving you the chance to practice your French and buy some fine local ingredients! All courses are taught by experienced, highly-qualified native French teachers, so you’ll be sure to have the best tuition possible! The Intensive Course offers 23 French classes each week, which is our most popular course and ideal for anyone looking to improve their general French skills. If you would prefer more teaching hours each week, opt for a Super-Intensive of 27 or even 32 lessons per week. The Super-Intensive course of 27 lessons includes general language lessons, as well as afternoon workshops focusing on other aspects of French, such as phonetics and culture + society. The Super-Intensive course of 32 lessons includes all of that, plus additional evening lessons on selected days throughout the week. If you’d like to combine group lessons with individual tuition, take the Combined Course of Intensive + Private Lessons, which gives you four additional private lessons on top of your Intensive group course. Or, you can choose a course of Private Lessons only, to completely customise your French programme! To really delve into the French culture, why not choose an Intensive + Wine Tasting course? This course combines 23 French lessons with one additional workshop where you will have the opportunity to sample some of the region’s finest wines. If cooking is more your thing, we also offer an Intensive + Cookery course, including 2 cookery workshops which give you the opportunity to try your hand at some of Toulouse’s most famous recipes! For more information about any of these French courses, please contact us. 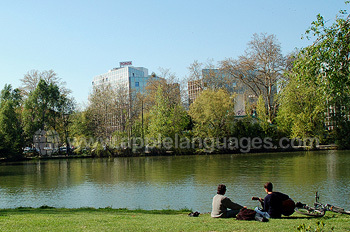 Live with the locals whilst you learn French in Toulouse! Host families, carefully chosen by our school, give you a taste of delicious local dishes, plenty of French practice and a glimpse of the French way of life! Accommodation is in single or shared rooms, on a bed and breakfast or half board basis. If you’d prefer to make your own meal arrangements, our school can arrange self-catering accommodation for you, sharing an apartment with French locals. You can also choose an executive host family if you would like your own private bathroom. If you would like a more independent experience, choose to stay in a studio apartment. All studios are located within 15 minutes of the school by public transport, and are equipped with a bedroom, kitchenette and bathroom. 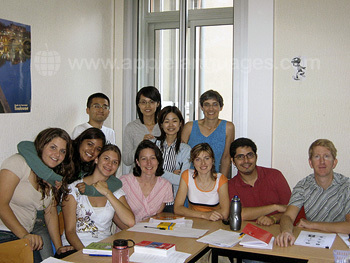 Helping you get the most from your time in Toulouse, the school offers a variety of activities and excursions. Discover the region’s rich culinary heritage with cookery lessons and meals out in local restaurants. A typical program also includes guided tours of Toulouse’s historic sights, boat cruises down the Garonne river or Canal du Midi, wine-tasting, sports like ice-skating and football, film-nights and much more! There are trips to Mediterranean beaches, the Pyrenees and Carcassonne, with its majestic city walls. The school can also help you to get in touch with French students who are learning your native language, giving you both a chance to practice your language skills! Private airport transfers from Toulouse are included in the price if you choose to book accommodation with us! Average score for our school in Toulouse based on 10 previous client reviews. The 2 week course was very comprehensive with a focus on grammar and phonetics. The teacher was engaging and interactive. There was also opportunity for extracurricular learning. The accomodation was appropriate and my hostess friendly. It was within easy walking distance to the school or 15 min via direct bus route. All instructors and staff were wonderful and my primary instructor, Claire, is a very talented instructor - she is amazing and I learned a lot from her. My studio apartment was cute and very well situated close to the school, to the Capitol, and in a very charming part of the city (La Daurade near the Pont Neuf) so it was wonderful. The landlord picked me up at the airport so that was very helpful and she was extremely nice. I found the course very helpful and great fun. I met some very interesting people. The accommodation was good. My host family were very friendly and helpful. It was clean and there was plenty of food. The school has a great atmosphere, dedicated and friendly staff, and the course was well structured and offered a great variety of methods. It was a great experience, thanks to the wonderful teachers and the welcoming and helpful reception staff! I lived with a lovely host family, generous, helpful and very nice. My room was spacious, the facilities clean and well maintained. I enjoyed my time with the family! The course was interesting, challenging and rewarding. The accommodation was fine, the owners were very welcoming and helpful. The course was great and so were the teachers. Although I was there for only 2 weeks I think I became more confident in terms of speaking than before as I had to use it with the locals. I wish I could have stayed longer. I loved my homestay, the host family was wonderful and the house was beautifully furnished as well. I felt at home and very pleased. Toulouse is a wonderful city!